" The East was menaced as well as the West, and the great outstanding fact in the history of the fifth century is that the East survived and the West succumbed. The success of the Eastern government in steering through these perils was partly due to the fact that during this critical time it was on good terms, only seldom and briefly interrupted, with Persia, its formidable neighbour. The diminished Roman Empire, now centering entirely in Constantinople, lasted for a thousand years, surrounded by enemies and frequently engaged in a struggle for life or death, but for the greater part of that long period the most powerful State in Europe. Its history is marked by distinct ages of expansion, decline, and resuscitation, which are easily remembered and help to simplify the long series of the annals of Byzantium.
" Having maintained itself in the fifth century and won its way through the German peril, it found itself strong enough in the sixth to take the offensive and to recover Africa and Italy. Overstrain led to a decline, of which Persia took advantage, and when this danger had been overcome, the Saracens appeared as a new and more formidable force and deprived the Empire of important provinces in Asia, while at the same time European territory was lost to the Bulgarians and the Slavs (seventh century). Then a period of resuscitation in the eighth and ninth centuries led to a new age of brilliance and expansion (ninth to eleventh centuries). When the Saracens had ceased to be formidable, the Seljuk Turks appeared, and the Empire found it difficult to hold its own against this foe as well as against the western powers of Europe, and the barbarians of the north. This period ends with the disaster of 1204, when Constantinople fell into the hands of the Crusaders, who treated the city with more barbarity than the barbarian Alaric had treated Rome eight hundred years before. 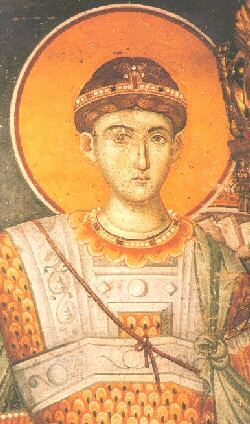 After this the cycle begins anew; first, the period of revival at Nicaea, which became the temporary capital; then the recovery of Constantinople (1261), followed by a period in which the Empire could assert its power; finally, from the middle of the fourteenth century, the decline, and the last death-struggle with the Ottomans, ending in the capture of the city in 1453.
" The State which maintained itself in unbroken continuity throughout the vicissitudes of more than a thousand years is proverbial for its conservative spirit. It was conservative in its constitution and institutions, in the principles and the fashions of its civilisation, in its religion, in its political and social machinery. It may be conjectured that this conservatism is partly to be attributed to the influence of the legal profession. Lawyers are always conservative and suspicious of change, and it would be difficult to exaggerate their importance and the power of their opinion in the later Empire. It was natural and just that their influence should be great, for it has well been observed that it was to the existence of a "judicial establishment, guided by a published code, and controlled by a body of lawyers educated in public schools, that the subjects of the Empire were chiefly indebted for the superiority in civilisation which they retained over the rest of the world." But the conservatism of Byzantium is often represented as more rigid than it actually was. The State could not have survived if it had not been constantly adapting its institutions to new circumstances. We have seen how its external history may be divided into periods. But its administrative organisation, its literature, its art display equally well-defined stages."